The cost savings of heating and cooling with heat pumps continues to increase as energy prices rise and the advantages of air to water heat pumps become more known. The latest trend for heat pump use can be found in the application to heat domestic hot water. Using a heat pump for hot water use is a great cost saving use and can be easily added to any Arctic Heat Pump system. Companies such as Rheem, GE and A.O Smith are all now manufacturing integrated heat pump water heaters that use a heat pump to extract the energy from the air and transfer it to the domestic hot water tank. These single tank systems are designed for domestic hot water and unlike an Arctic Heat Pump can do little more than heat water to about 120 F. With an Arctic Heat Pump System, a home owner can heat and cool their house, pool or hot tub as well as provide them with domestic hot water all year round. Using a heat pump for hot water is a great investment in warm climates but not in colder climates such as Northern USA or Canada where there is a large heating need, here is why. A heat pump is nothing more than what its name implies, it “pumps” heat energy from one location to another. With an Arctic Heat Pump water heater that energy is pumped from outside the house to and indoor buffer storage tank. This is where the cost saving comes from as the outdoor energy it “pumps” is free. However, if we place a heat pump indoors to transfer the indoor energy to the water tank this energy is not free as we have already paid to create it in the winter time via our furnace or boiler. So, these standalone heat pump water heaters are simply moving paid energy from the basement room to the water tank with $0 cost savings. In warmer climates where cooling is the primary load these utility style heat pump water heaters make economic sense as they assist the AC by removing unwanted heat energy from the room at a cost like operating an air conditioner. The hot air in the room is pumped into the water tank leaving the house colder. 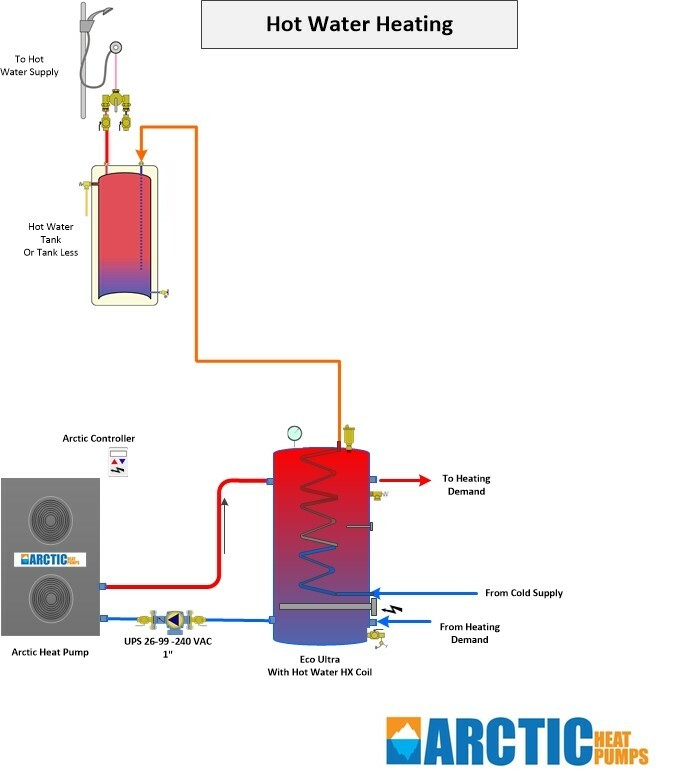 An Arctic Heat Pump system heats hot water completely different than any packaged water heat pump. 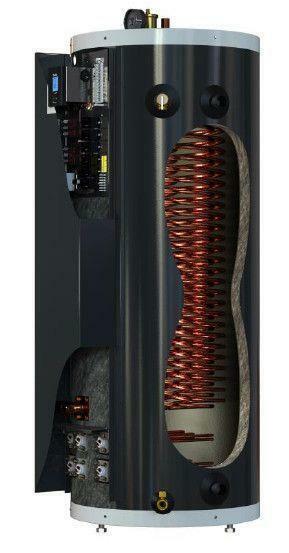 The heat pump is located outside and removes the “FREE” energy from the air and transfers it to a buffer tank. Inside the buffer tank is an optional hot water heating coil. This copper coil is 200 feet in length with a total surface area of 26.2 ft2. Cold water from the house enters this coil and the heat energy within the tank is transferred to the domestic hot water via this large heat exchanger. This is very similar to an on demand or tank less hot water system. In most cases we recommend a small water tank or tank less heater be used after the heat pump to top up the heat to a higher temperature. The use of Freon R410A in any heat pump including geothermal, has a maximum temperature of approx. 130 F and as such to reach 140-160 F the water will require a small boast. The large coil can provide nearly 96% heat transfer to the domestic hot water as can be seen by this chart below.